For shipments outside the contiguous United States, contact factory for applicable terms & conditions. All shipments are F.O.B. our plants, vendors, Distribution Centers or Field Warehouses: All orders for Growlite products having a distributor price of $1,500 or more for one consignee for one shipment qualify for freight allowance. All Growlite orders having a distributor price less than $1,500 will be assessed freight and handling charges. ALL SHIPMENTS – For all orders that qualify for freight allowance, we reserve the right to select the carrier and to route shipments at our discretion. We will ship in the manner selected by the customer provided the customer assumes any additional transportation costs. PARTIAL RELEASES – If an order has multiple releases specified by the Buyer, each release will be treated as an individual order, relative to freight allowance and minimum billing. Prices are subject to change without notice. In the event of a price increase, all accepted orders on hand will be filled at lower prices provided such orders are released for shipping prior to the effective date of the price increase. If the orders are not released for shipment prior to the price increase, the orders will be billed at prices in effect at the time of shipment. Special quoted orders that cannot be released for shipping prior to the price increase may be subject to an increase in price. Orders marked HOLD or HOLD FOR RELEASE will be billed at the prices in effect on the date that shipment is requested. Minimum billing for all products or parts orders is $100 net. Prices do not include lamps. TAXES: Buyer will pay any and all applicable sales tax or use tax, if any, plus any other applicable federal, state, or local taxes. All prices, quotations, orders and agreements are subject to said taxes and will be added to the invoice unless legal proof of exemption is provided. Merchandise is not returnable without the written approval of Barron Light Group and/or Growlite. Request for a return must be made in writing within 30 days from the date of shipment. Any material returned without authorization will be returned to the customer, freight collect, and no credit will be issued. Freight shipment to the factory will be prepaid by the customer. All material must be received in a saleable condition and in the original packaging. Products will be inspected upon return to determine whether they will be repaired or replaced as long as it is within the warranty period. Returns will not be issued for discontinued products. All non-stock, special, custom made or outdated and modified versions of normal factory stock items are non-returnable, this includes poles. No merchandise may be returned without prior written authorization. Requests to return merchandise must be made with our agents for transmittal to Barron Lighting Group within six (6) months from date of shipment by us. All returns must be shipped prepaid to the location designated on the return authorization. Credit will be issued based on the original invoice price, or price in effect at time of return, whichever is lower, less a minimum disposition charge of 35% (to defray our cost of handling). All returned product must be in saleable condition in order to qualify for credit. Barron Lighting Group warrants all products sold hereunder to be free from defect in manufacturing, under normal and proper storage, installation, and use, for the period designated below, calculated from the date of shipment (excluding lamps). Our liability extends only to the repair or replacement of the defective part. Buyer is responsible for all costs to uninstall defective products and re-install replacement or repaired products and Barron Lighting Group will not be liable for labor or other costs related to de-installation or re-installation. Barron Lighting Group shall not be liable for damages that result from deliveries that do not occur within a customer's specified time frame or for any delay or default in delivering products where occasioned by any cause beyond the control of Barron Lighting Group, including without limitation embargoes; shortages of labor, raw materials or fuel; fires; floods; accidents; acts of war; or other similar causes. Warranty(s) will not apply to loss or damage to the product caused by: negligence; abuse; misuse; mishandling; improper installation, storage or maintenance; damage due to fire or acts of God; vandalism; civil disturbances; power surges; improper power supply; electrical current fluctuations; corrosive environment installations; induced vibration; harmonic oscillation or resonance associated with movement of air currents around the product; alteration; accident; failure to follow installation, operating, maintenance or environmental instructions prescribed by Barron Lighting Group or applicable electrical codes; or improper service of the product performed by someone other than Barron Lighting Group or its authorized service provider. This limited warranty relates to the repair or replacement of the product. Barron Lighting Group does not warrant non-LED lamps, ballasts, drivers, capacitors, igniters, battery packs, photocells, occupancy sensors, low voltage indicators, fuses, surge protection devices and other control devices that are not manufactured by Barron Lighting Group. Applicable third party manufacturer warranty(s) shall apply for such devices. Warranty limitations are the same as above. Growlite reflectors and/or hoods are warranted for a period of five (5) years, calculated from the date of shipment. Electronic ballasts are not manufactured by Growlite or Barron Lighting Group and will be warranted by the manufacturer for a period of three (3) years. Lamps are not manufactured by Growlite or Barron Lighting Group and are not warranted by the manufacturer. 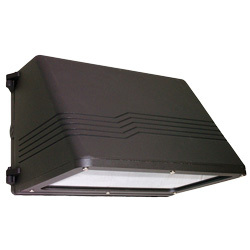 Growlite LED fixtures are warranted for a period of five (5) years, calculated from the date of shipment. The determination of whether the product is defective shall be made by Barron Lighting Group in its sole discretion with consideration given to the overall performance of the product. A product shall not be considered defective solely as a result of the failure of individual LED components to emit light if the number of inoperable components is less than 10% of the total number of LED components in the product. A product shall not be considered defective solely as a result of changes or revisions to any mandatory federal, state, or local energy efficiency standards. Warranty claims must be submitted in writing within (30) days of discovery of the defect or failure to an authorized Barron Lighting Group sales or customer service representative. Product(s) or component part(s) may be required to be returned, freight prepaid, for inspection and verification of non-conformance by Seller, but no product or component part(s) will be accepted for inspection, verification or return unless accompanied by an RMA "return authorization number" which can be obtained only from an authorized Barron Lighting Group sales or customer service representative. A failure to timely notify Seller of a warranty claim shall constitute a waiver of such claim.